​CHMR-FM is actively seeking individuals from the campus of Memorial University, and from the community at large, who are interested in joining our ranks - no previous experience in radio required! In fact, we'll show you all you need to know in order to get you started. We offer experience in a number of different realms for our volunteers, be it through hosting your very own radio program, reading news breaks, reporting, or in-house production. For more information, feel free to get in touch with us by means of the methods listed on our contact page. Alternatively, we encourage prospective volunteers to drop by our station. We're located on Memorial University's Prince Philip Drive campus in room UC2009. Just ring the bell during business hours (9:30 - 4:30, Monday to Friday) and we'll be happy to answer any questions, and give you the grand tour. ​Training takes place in our studios, room UC-2009, located in the University Centre on the MUN Campus. In order to make classes as effective as possible, class size is limited to 5 people per session. As such, registration is necessary. ​​To register, email ﻿﻿robert.earle@mun.ca﻿﻿. You will receive an email confirmation of your registration within 24 hours. 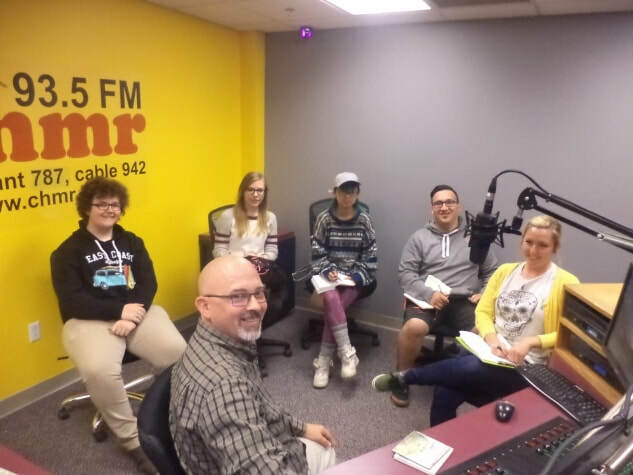 ​The news department offers a number of opportunities for people interested in gaining experience reading, writing, or reporting news, as well as covering live events on campus via remote broadcasts. If this interests you, contact our News Director, Colleen Power, at chmrnewsdirector@gmail.com to set up a meeting and discuss your interests. Many News Department volunteers find themselves reading newsbreaks on-air the same day of their meeting. Even if your interest is really in hosting your own program, this is a great way to get your feet wet! ​Training for those involved in hosting a full program is somewhat more in-depth (it takes about 3 hours), so we try to train as many people as possible at the same time. The date for a training session will be determined and posted to our website. During this session we will provide you with everything you need to know when it comes to radio and our station. You don't have to reserve a seat, just show up about 5-10 minutes in advance so that we can have you complete an application to volunteer. There are two parts to the training session. The first half of the class focuses on in-house rules and policies as well as government regulations concerning campus/community radio. The second part of the class focuses on the technical side of broadcasting and provides hands-on experience with the equipment you'll be using in the production of your own show. In the days and weeks following the class, you'll come to the station to practice in our production room according to your own schedule and the room's availability. When you feel confident with our regulations and equipment, and have a solid idea of what you want to do with a program, we'll set you up with your own weekly timeslot! You will have the option to host your show live, or you can pre-record it. What type of radio show can I do? ​CHMR is an open format radio station, meaning that just about anything goes. It is our mandate, however, to promote new, and lesser known artists to the community, and to provide programming that is unique in comparison to what other stations in St. John's broadcast. As such, we are not accepting any more programs which feature Top 40 hits (defined as a hit on Billboard's Hot 100, or Billboard's Canadian Hot 100). We are mostly interested in people who want to produce programs that are a little off the beaten path - programs that feature Spoken Word, Jazz, Blues, Classical, World, and "New" Independent Rock are all of great interest to us. Does it cost anything to join CHMR? ​MUN Undergraduate students pay what's called a Media Levy when they pay their tuition. As such, involvement at CHMR for undergrads is free. Students who do not pay undergraduate fees to MUNSU (e.g. Grad students, students of the College of the North Atlantic, Marine Institute students, etc.) and non-students are required to pay a one-time training fee of $20, followed by an annual membership fee of $20 which is due when they begin on the air.